This week it’s the turn of Alexis Krachai, managing director of Sheffield-based communications and public affairs company, Counter Context. One theme that seemed to be prominent in this week’s news was big media names relocating to the North. As a business born and based in this part of the world, it’s encouraging to see companies exploring the benefits of moving up the M1 and M6. News that both The Guardian and Channel 4 are looking beyond London shows that the Northern Powerhouse is more than a just a political headline. More and more companies are recognising the strategic and commercial strength of our part of the UK. 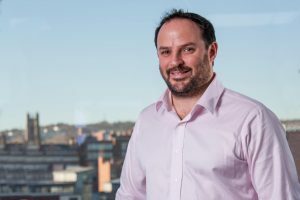 News from companies like online retail giant ASOS, announcing further investment in South Yorkshire along with the stream of appointments from the likes of Access and Hotfoot, shows that the orth is shrugging off the uncertainty prompted by Brexit and getting on with the task of growing the economy. It is not just the pace of life up here that is exhilarating. We are now all used to the speed that a few inappropriate words can spread across cyberspace. The words ‘like wild fire’ come to mind. David Moyes’ recent comments to a female journalist off camera go to show how careful those in the spotlight need to be. Working with clients from around the world our message is simple; never say anything in public you would not want to see written on the front page of the newspaper. Whilst social media continues to rapidly evolve our world of news, the advertising and marketing industries can’t afford to stand still either. The call by Johnson Press and Newsquest that agencies and national brands should use local news media more should not go unnoticed. At Counter Context we focus on building understanding, trust and support for our clients and their projects. Online advertising has a role to play, but the risks shouldn’t be ignored. We continue to work closely with many local titles. In our experience, people still turn to the local press to get the news that they trust.